The Japanese had two labour forces, one based in Siam (Thailand) and the other in Burma they worked from opposite ends of the line towards the centre. The graves of those who died during the construction and maintenance of the Thai/Burma railway (except for the Americans, whose remains were repatriated back to USA) were transferred from camp burial grounds and isolated sites along the railway into three cemeteries at either Chungkai and Kanchanaburi in Thailand or Thanbyuzayat in Myanmar (Burma). 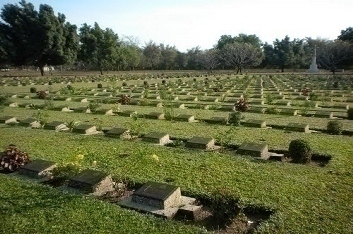 After the surrender of the Japanese Forces on 15 August 1945 a decision was made that all POWs who died on the railway construction were to be exhumed and re-buried in either Thanbyuzayat War Cemetery (Burma) or Kanchanaburi War Cemetery (Thailand). Due to the vast extent of the 451km of railway, it was decided to divide the railway into 2 sectors, with the large marshalling yards at Neike affording a convenient point of demarcation. It was therefore decided that those buried between Thanbyuzayat and Neike would be exhumed and re-buried at Thanbyuzayat. Those buried from Neike to Nong Pladuk (Thailand), would be relocated to Chungkai or Kanchanaburi. A small band of dedicated workers assisted the War Graves Commission Representatives with the enormous task to locate several thousand Allied POW remains scattered in approx 144 cemeteries along the length of the railway. The task was made even greater as many cemeteries had been reclaimed by the jungle over the previous two years following the joining of the lines from both ends on 17 Oct 1943. 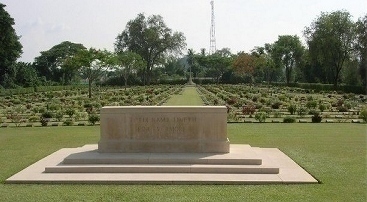 Chungkai War Cemetery is approximately 5 kilometres west of Kanchanaburi War Cemetery. Chungkai was one of the base camps on the railway and contained a hospital and church built by Allied prisoners of war. The war cemetery is the original burial ground started by the prisoners themselves, and the burials are mostly of men who died at the hospital. 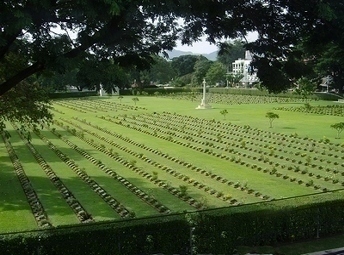 Australian POWs who were originally buried at in this cemetery were exhumed and moved to Kanchanaburi War Cemetery on a decision by Australian authorities. There are 1,740 buried in this cemetery which includes 1384 British and 313 Dutch. The cemetery is beautifully maintained by the Commonwealth War Graves Commission (CWGC) located at Maidenshead in England. Maintenance of the grounds is conducted by local residents. Kanchanaburi is 129 kilometres West-North-West of Bangkok. The cemetery is a short distance from the site of the former 'Kanburi' base camp, through which thousands of POWs passed on their way to other camps. During the railway construction, approximately 13,000 POWs died and were buried along the railway. Kanchanaburi is the largest of the 3 war cemeteries, containing the remains of those who died building the Thai/Burma railway. The cemetery is beautifully maintained by the Commonwealth War Graves Commission (CWGC) located at Maidenshead in England. Maintenance of the grounds is conducted by local residents. There are 6982 buried or commemorated in this cemetery which include 3,568 British, 1362 Australian and 1896 Dutch POWs. Kranji War Cemetery is 22 kilometres north of the city of Singapore, on the north side of Singapore Island overlooking the Straits of Johore. Prior to 1939 the Kranji area was a military camp and at the time of the Japanese invasion of Malaya, it was the site of a large ammunition magazine. On 8 February 1942, the Japanese crossed the Johore Straits in strength, landing at the mouth of the Kranji River within 2 miles of the place where the war cemetery now stands. After the fall of Singapore on 15 February 1942, the Japanese established a prisoner of war camp at Kranji and eventually a hospital was organized near by at Woodlands. After reoccupation of Singapore, the small cemetery started by the prisoners at Kranji was developed into a permanent war cemetery by the Army Graves Service when it became evident that a larger cemetery at Changi could not remain undisturbed. Changi had been the site of the main POW camp in Singapore and a large hospital had been set up there by the Australian Infantry Force. In 1946 the graves were moved to Kranji. There are 4,461 World War II casualties buried or commemorated at this cemetery, of which more than 850 of these are unidentified. Labuan War Cemetery is on the small island of Labuan (part of Sabah, Malaysia) in Brunei Bay, off the coast of north-west Borneo. The cemetery is a Commonwealth World War II cemetery. The total number of burials is 3,908. Number of identified casualties is 1788. The preponderance of unidentified graves is due to the destruction of all the records of the camps by Colonel Suya, the Japanese Commandant for Borneo camps. Many of the personnel buried in this cemetery, including Indian and Australian troops, were killed during the Japanese invasion of Borneo or the Borneo campaign of 1945. After the fall of Singapore several thousand British and Australian prisoners of war were sent to camps in Borneo, mainly in the Sandakan area on the eastern coast of North Borneo, where they were employed on aerodrome construction. The Australians belonged to the 8th Australian Division ('B' force, numbering 1,494 and 'E' force, 500). In October 1943, most of the officers were separated from their men and sent to Kuching. In February 1945, the Japanese, anticipating the Allied landings in North Borneo, decided to move the prisoners of war westwards to Ranau, more than 160 miles (257 km) inland from Sandakan. Although many had already been transferred to other centres, more than 2,000 British and Australian servicemen remained to take part in the 'Death March to Ranau. Only six survived Sandakan and the death marches. The village of Thanbyuzayat is 65 kilometres south of the port of Moulmein in Burma/Myanmar, and the war cemetery lies at the foot of the hills which separate the Union of Myanmar (Burma) from Thailand. There are now 3,771 graves in this cemetery which include 1335 Australian, 1588 British and 621 Dutch. The cemetery is beautifully maintained by the Commonwealth War Graves Commission (CWGC) located at Maidenshead in England. Maintenance of the grounds is conducted by local residents.